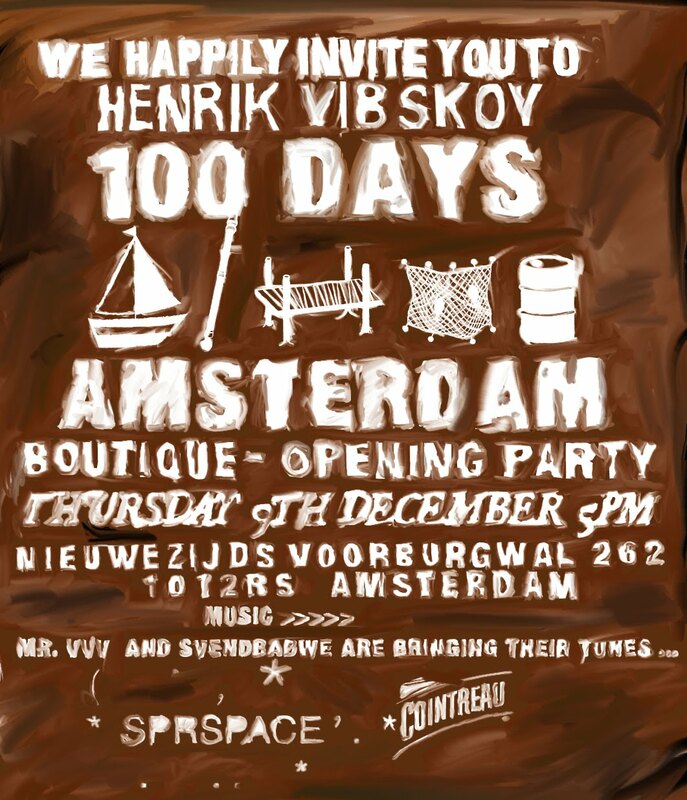 Henrik Vibskov Boutique: HENRIK VIBSKOV: INVITATION: AMSTERDAM SHOP OPENING "100 DAYS"
HENRIK VIBSKOV: INVITATION: AMSTERDAM SHOP OPENING "100 DAYS"
On 9th December, Henrik Vibskov is launching his new retail concept '100 DAYS' at SPRSPACE in Amsterdam. The store will move around the world, existing for 100 days per season per city, reflecting the current show and theme of the collections. "Inspired by all the travelling, and by not committing to a long term lease, we are free to experiment with spaces and installations and present the full collection - including showpieces, one-offs and pieces that were edited out of the collection before the show. ", says Henrik Vibskov. The first venue to host 100 DAYS is Amsterdam's SPRSPACE. Taking off in the universe of the the Last Pier Pandemonium Show, presented during Paris Men's Week and Milan Women's week, the rusty color will be a central part of the installation. The show's installation will be deconstructed and redesigned to fit the temporary retail environment. Around the 50th day of '100 DAYS', the brand new summer collection of Henrik Vibskov will be hitting the store. SPRSPACE is the brand new inspiring project space of the Dutch shop SPRMRKT, which is a long time Henrik Vibskov retailer and partner of the Amsterdam leg in this project. Next to exhibitions and retail concepts, SPRSPACE hosts the SPRMRKT archive store on its first floor. 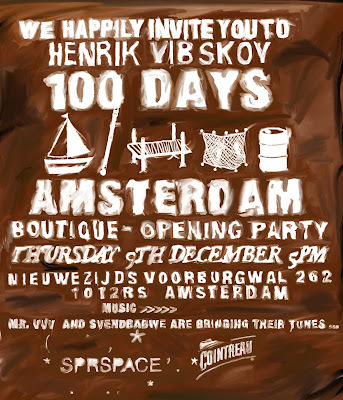 You are hereby invited to the opening of the first edition of 100 DAYS that will take place on the 9th December 2010, 5pm at SPRSPACE, Nieuwezijds Voorburgwal 262, Amsterdam.